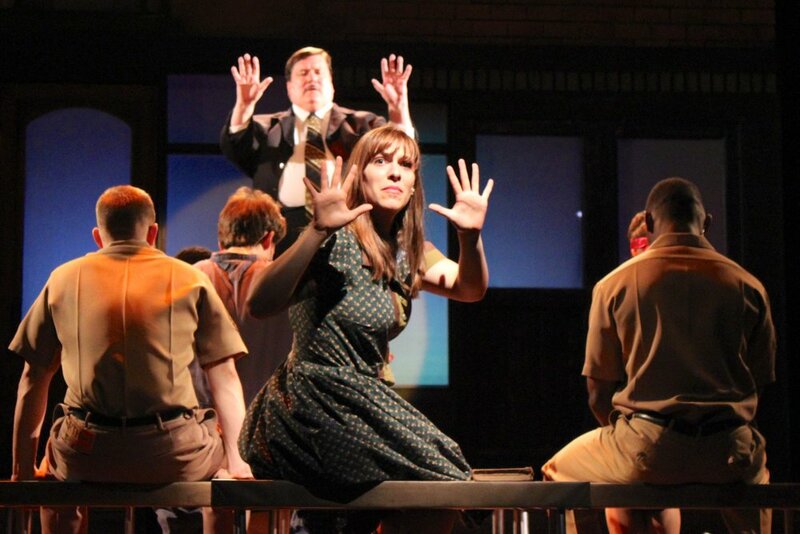 We have been making professional and innovative theatre in Central Virginia for over 10 years. Check our some of our past productions below. Buddy - The Buddy Holly Story tells the true story of Buddy’s meteoric rise to fame, from the moment in 1957 when ‘That’ll Be The Day’ hit the airwaves until his tragic death less than two years later on “the day the music died”. The show features over 20 of Buddy Holly’s greatest hits including ‘That’ll Be The Day’, ‘Peggy Sue’, ‘Everyday’, ‘Oh Boy’, ‘Not Fade Away’, ‘Rave On’ and ‘Raining In My Heart’, plus Ritchie Valens’ ‘La Bamba’ and the big bopper’s ‘Chantilly Lace’. The magic of the forest brings young lovers together... while confusing everyone else. Shakespeare's classic comedy As You Like It gets back to nature in true Endstation fashion, by marrying the natural beauty of Virginia with the poetic beauty of the theatre. Escaping from their hostile family, Rosalind and her best friend Celia leave civilization for the fabled Forest of Arden. Dressed as brother and sister, with their trusted friend the fool as their only companion, they encounter a handsome wrestler, a banished outlaw and his merry men, and the true ruler of the forest... a king with his own antlers. As Rosalind transforms into a young shepherd, she teaches Orlando – and us – how to fall in love in the way only Shakespeare can – with quick minds, sharp tongues, and pounding hearts. A Tuesday night, shortly before Christmas 1956, four legends, Johnny Cash, Jerry Lee Lewis, Carl Perkins and Elvis Presley gathered at the Sun Record recording studio in Memphis, Tennessee, where they’d launched their careers. Word soon leaked out of an impromptu jam session. A newspaper man who was there wrote, ‘This quartet could sell a million.’ Soon, they were dubbed the Million Dollar Quartet. This was their only performance, a cultural flashpoint that caught rock ‘n’ roll at the moment of creation. From Washington to Watergate, yea verily from the Bering Straits to Baghdad, from New World to New World Order – The Complete History of America (abridged) is a ninety minute rollercoaster ride through the glorious quagmire that is American History, reminding us that it’s not the length of your history that matters – it’s what you’ve done with it! A confederate soldier returns home to the only family he has left: two of his former slaves, now emancipated. The secrets and lies contained in their family history come to light in an evening of total suspense. The spectacular musical biography of the legendary singer-songwriter frequently mentioned alongside Louis Armstrong, Robert Johnson, Duke Ellington, Elvis and Bob Dylan as one of the great innovators of American popular music. The play follows Williams' rise from his beginnings on the Louisiana Hayride to his triumphs on the Grand Ole Opry to his eventual self-destruction at twenty-nine. Along the way, we are treated to indelible songs like "I'm So Lonesome I Could Cry," "Move It on Over" and "Hey, Good Lookin'," which are given fresh and profound resonance set in the context of Williams' life. One of Shakespeare's most notable works follows the mischevious doings of a nobleman and his games that result in an unlikely couple falling in love and the misconception of another character's death. In Partnership with Central Health, Live Healthy Lynchburg, Amazement Square, the Education Foundaiton, and the Junior League of Lynchburg, this show for yound audiences featured Gary Garlic, Betty Broc, and Russell Brussel and taught healthy nutrition habits. Conceived by William Meade and created by Richard Maltby, Jr.
From the iconic songbook of Johnny Cash comes this unique musical about love and faith, struggle and success, rowdiness and redemption, and home and family. More than two dozen classic hits—including “I Walk The Line,” “A Boy Named Sue,” “Folsom Prison Blues,” and the title tune—performed by a multi-talented cast, paint a musical portrait of The Man in Black that promises to be a foot-stompin’, crowd-pleasin’ salute to a uniquely American legend! Though he is never impersonated, Johnny Cash’s remarkable life story is told through his music, climaxing in a concert that will both move and exhilarate! A dark comedy revolved around a young couple from Charlottesville experiencing Lynchburg's Texas Inn and how class divide affects us all. Who are the two gentlemen you may ask? A young Thomas Jefferson and James Madison. What better place for this production to spend its opening weekend but at Thomas Jefferson’s retreat home, Poplar Forest. This incredible play about the beauty and ephemeral nature of life was inventively illuminated at Lynchburg's historic Old City Cemetery. Written by Ted Swindley. Based on a true story. Always…Patsy Cline was more than a tribute to the legendary country singer who died tragically at age 30 in a plane crash in 1963. Commissioned by Endstation Theatre Company, Sweet Briar College, The Greater Lynchburg Community Trust, and the Virginia Center for the Creative Arts, In Sweet Remembrance is a tribute to the significant role of the black community throughout Sweet Briar College’s history. Written By: William Shakespeare Directed By: Geoffrey Kershner The play opens as the student Lucentio arrives in Padua. He hears that the merchant Baptista has two daughters, but the younger, prettier daughter, Bianca, cannot be married before her strong-willed sister, Katherina. On seeing Bianca Lucentio falls in love with her and changes identities with his servant Tranio. Bianca already has two suitors, but doesn’t like either. The elderly Gremio hires Lucentio, disguised as a Latin tutor, to woo Bianca on his behalf, while Hortensio disguises himself as a musician to get access to her. Meanwhile Petruchio, a young adventurer from Verona, arrives to visit hisfriend Hortensio. He learns about Katherina and decides to woo her, aided by both Gremio and Hortensio. Cymbeline is King of Britain; his first wife died, and he married a wicked queen. Imogen, Cymbeline's daughter is in love with Posthumus, but her stepmother wants Imogen to marry Cloten, the queen's son. When Imogen balks and secretly marries Posthumus, the king has him banished. 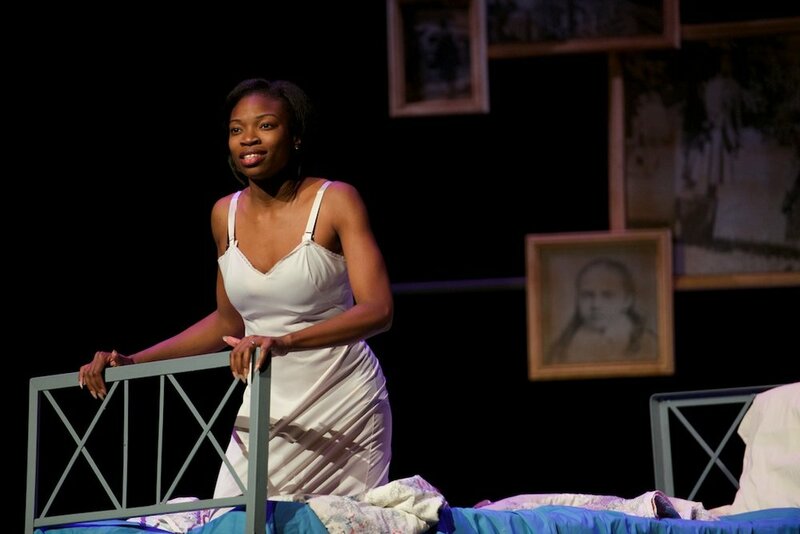 Set in 1964 in the Deep South with the backdrop of the Civil Rights Movement, Violet follows the emotional transformation of a young woman accidentally scarred by her father. An original piece set in the Blue Ridge foothills in 1900 and 2000, Unearthed follows the troubled lives of Alzy and Wade, who in their own time each discover the same strange man buried in the woods. A merchant of Syracuse, is condemned to death in Ephesus for violating the ban against travel between the two rival cities. As he is led to his execution, he tells the Ephesian Duke, Solinus, that he has come to Syracuse in search of his wife and one of his twin sons, who were separated from him 25 years ago in a shipwreck. The other twin, who grew up with Egeon, is also traveling the world in search of the missing half of their family. (The twins, we learn, are identical, and each has an identical twin slave named Dromio.) The Duke is so moved by this story that he grants Egeon a day to raise the thousand-mark ransom that would be necessary to save his life. 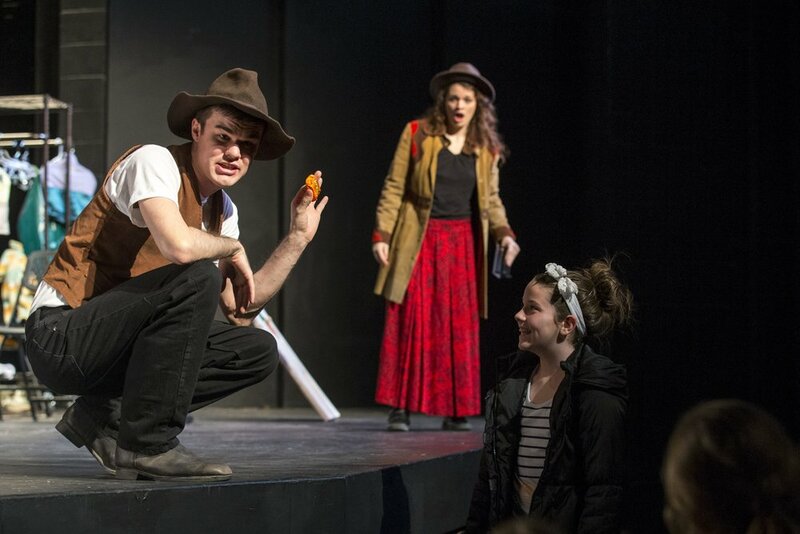 Written for young audiences by Endstation’s resident playwright, Josh Mikel, this original play debuted at the New York International Fringe Festival in 2010. This one-woman show, which was conceived and was performed by the talented Adelind Horan, tackles the complex issue of mountaintop coal removal in the Appalachian Mountains. This most American of musicals lays bare the lives of nine infamous historical figures, who forged their way into our history books for their assassinations (or attempted assassinations) of some of our American presidents. Commonly regarded as Shakespeare’s best comedy, this hysterical play is filled with mistaken identities, romance, and a little cross-dressing. 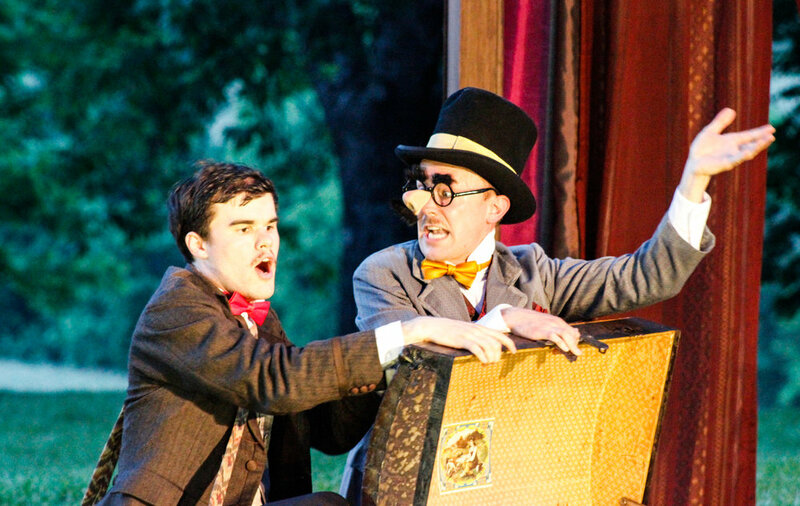 Endstation staged this hilarious comedy at Sweet Briar’s old train station, utilizing a stunning mountain vista as its backdrop. Each night, audiences enjoyed a beautiful sunset while watching the tale unfold. Alice in Wonderland was our first production for young audiences. 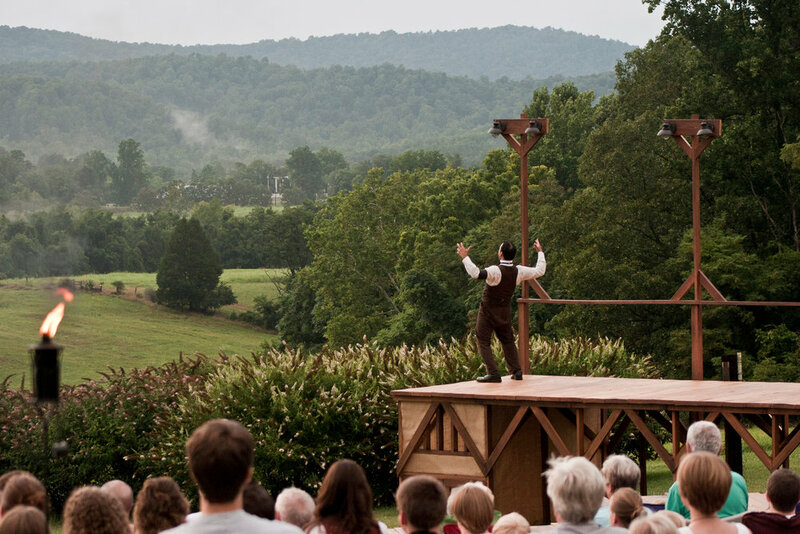 Our outdoor production of Shakespeare’s classic tragedy Hamlet set in Civil War Virginia. The Bluest Water is a memory play that takes the audience from 1969 Nelson County to Nelson County in present day. The play’s fictional characters try to heal as individuals and as a community in the face of great loss. This exciting original production was created in workshop at Sweet Briar College and was performed in 2007 in Lynchburg, Amherst, and Charlottesville, Virginia. It was also featured as part of the 2007 Washington DC Capital Fringe Festival. The production took some of Edgar Allan Poe’s most famous stories and poems and placed them in a Victorian psych ward of Endstation’s creation. This exciting piece of environmental theatre included vivid story telling, live percussion, and thrilled audiences across the Commonwealth.